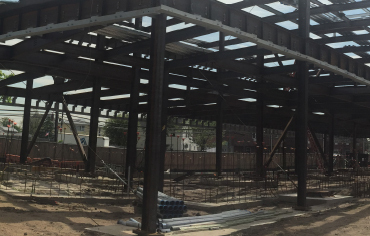 Arcadia Electrical was contracted to help with the construction of PS 335Q, a new public school being built from the ground-up in the Ozone Park neighborhood of Queens. The 70,000-square foot building will accommodate just over 500 students between kindergarten and fifth grade. Arcadia Electrical is completing the full electrical installation within the school. The work will include the entire electrical distribution system along with the public address system, bell system, fire alarms, theatrical lighting in the auditorium and LED lights throughout the building. Additionally, Arcadia Electrical will install safety and security features like card reader access, panic bars that will sound an alarm if a door that should not be opened is breached, a closed-circuit television security system and a rescue room, in a room closest to the street that will enable firefighters and rescue workers easy access to the school should the need arise. Arcadia Electrical will also bring in whiteboards for each classroom to make sure the school is outfitted with the best of today’s technology.